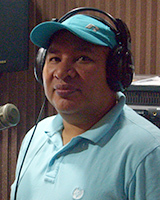 I started as a volunteer recording some Spanish announcements on KJTS, the Spanish station of Kinship Christian Radio in 2011 and was hired as a part time announcer in November 2014. My wife, Elizabeth, and I have been married for 24 years and have been blessed with two children: Jovany and Daniel. We are also proud grandparents of Ila Noemy. My parents Brigido and Reyna live in Mexico, my brother, Jose lives in Texas and my sister, Maria lives in Minnesota. My wife and I are immigrants from Mexico. We lived in Texas for 9 years and then moved to Minnesota in 2001. We have attended the Evangelical Free Church Cornerstone in Blue Earth for 7 years. I became a believer when I was 18 years old. I have multiple jobs and interests. I am serving as a Hispanic minister in the church, visit people in the hospital, those in jail and with families in need. I also work full time in the Mexican restaurant in Blue Earth.